Local Authorized copier dealers are "locally grown"
I read an article that said buying a copier locally is like buying from your local farmer's market. Hmmm…sure it is…thats what I thought...then I kept reading and it's true! “At a farmer's market, you get friendly service from people you know and fresh, locally-grown produce -- plus, you're helping local business." The same can be said for buying a copier locally. You're not only contributing to local business; you're also getting a quality product with an instantly-accessible support team. Local people supporting local business. Money stays local and support stays local. 1. Local authorized dealers aren’t controlled by a large corporation. The “red tape” often involved in dealing with large corporations doesn’t exist. Local dealers can make a decision fast to ensure your business needs are met quickly and efficiently. 2. Local authorized dealers can give you a wider array of options because they deal with multiple copier manufacturers. Local dealers find the copier to fit your needs. They offer the brands they want to sell. When you deal with a manufacturer you get offered only what they make. They will offer equipment even it if isn’t the right fit because that’s all they have. 3. When it comes to repairs and maintenance, you'll get faster and more personalized service with a local authorized dealer. You receive local service dispatched from a local office. To save costs, manufacturer-owned dealerships often only offer the bare minimum in a local office and have all their service and supply issues handled from a corporate office. 4. All billing is done locally when you use a local authorized dealer. You'll get fast, immediately-accessible support with billing questions. 5. A local dealer will generally have far less turnover and more staff longevity than manufacturer-direct dealerships -- which means that you always know with whom you're dealing. You aren’t just a name or number when you choose a local authorized dealer. 6. When you buy or lease your copier locally, you're working with the same company and people throughout – from making the purchase to getting the technology support you'll need along the way. This type of service accountability is something that you can only get from a local dealer because they'll give you complete customer support throughout the life of your copier. An “Authorized Copier Dealer” or Authorized dealer is backed by the brands they sell. They are locally owned and operated. They are not a branch or franchise. The manufacturer has deemed them competent and trained them to be able to sell and service their products. As an authorized dealer we choose the brands we offer. With an authorized copier dealer you will always get genuine branded parts, supplies and accessories. Small businesess grow from pure hard work and determination, from taking care of their customers and engaging with their community. A manufacturer dealer is part of a large corporation. Some may have local offices or showrooms, but that doesn’t mean the are a locally owned business. The service calls often aren't routed directly through the local office. they go to a dispatch center that may be across the country. It may handle thousands of calls from all over the country. They may have a branch manager but actual decision makers are not local. The manufacturers don’t offer special pricing to their dealers and they normally have huge overhead so, their pricing is not less. Also, if you’ve purchased a low end model, or small or single device, you may be considered a “small fish” to their organization and may not get the attention you need or expect . Manufacturers can only sell you the machines they manufacture, whether it's the best fit for you or not. 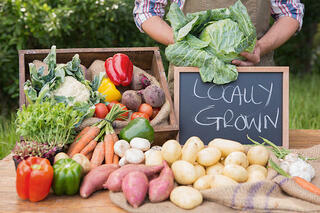 The next time you are looking for fresh fruit & veggies or a new copier think and buy locally! Dont miss out! Fill out info below.